The average Singaporean eats 33kg of chicken per year1. It’s the most protein consumed on our island by far after fish (21kg). So if you’re going to take on over half your body weight in chicken once a year then it makes sense to shop for the healthiest chicken available. As with our extensive two part blog post on organic food in Singapore this is on-the-ground research and we’ve done all the hard work for you by visiting the stores, hounding the suppliers and calling the farmers to find out exactly what’s going on under the hood of imported chickens in Singapore. The first table contains fresh chicken sources as compared with standard conventionally and commercially farmed chicken. If you look at the bottom of the table you’ll basically see that the only source of fresh and reasonably healthy chicken is from Toh Thye San and Meng Kee (Kee Song) farms in Malaysia. They’re both hormone, antibiotic, arsenic and drug free which is good. The Kee Song chicken is allegedly organic but they do not have an official certificate and they did not answer our questions that we directed to them both over the email and the phone so we can’t verify this. Both are raised in barns with the Toh Thye San chickens having more freedom and some sunlight exposure which is essential for the chicken’s immune system defense and vitamin D production. Toh Thye San’s chickens are fed a mixed diet whereas Meng Kee’s are fed grains (presumably organic but this is unverified). 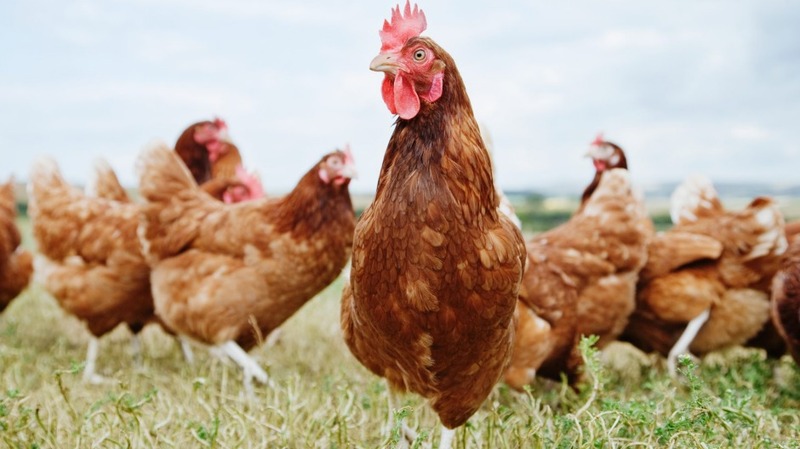 Feeding a chicken grain is not as harmful to it as it is to a cow but its far removed from a normal diet of bugs, insects, small mammals and various seeds. Unfortunately they both use a water chilling method which is not ideal. And finally the price. Meng Kee’s chicken is half the price of Ryan’s. Does that mean it’s a better choice? We don’t think so but see below for our conclusions. Water chilling is the most common way of chilling a chicken after it has been slaughtered. They basically take a whole bunch of chickens and throw them in large, almost freezing, tank of water. On the surface this doesn’t sound so bad but unfortunately it introduces a lot of problems. Firstly they use a lot of fresh water which is rather unsustainable, secondly the chickens absorb up to 12% of the water which dilutes the nutrients, removes some of the flavour but off course adds profits to the farmer’s bottom line as chickens are sold by weight. And lastly when a bunch of chickens are sharing a large chilled water bath if you have one sick it can cross contaminate the whole lot so this is prevented from happening by dumping a whole bunch of chlorine into the bath which of course gets absorbed by the chicken that you end up eating. In the frozen chicken category you also have chickens from Toh Thye San and the “almost perfect” chicken from Inglewood Farm in Australia. The only thing wrong with it is that its frozen. Freezing meat causes some cellular damage making it harder to digest and results in the animal losing about 30% of its nutrients and vitality. However this is a far far better alternative than consuming a whole bunch of unwanted toxins from conventional chickens. Particularly 33kg of toxic chicken meat per year. In summary we believe the chickens from Toh Thye San farm are the best quality fresh chicken’s available in Singapore. They are the most healthy choice and are used by some of Singapore’s top restaurants such as Par Andre, Imperial Treasure, Joel Robuchon, Iggy’s and Burnt Ends. They are much tastier than Meng Kee’s Kee Song chickens and are very transparent about their farming process. Our next choice would be the frozen chicken’s from Inglewood Farm in Australia. And last would be the Kee Song chickens and until we get more information from them about their organic processes we just can’t recommend their product. Levitise does not recommend consuming conventional and commercial chicken at all on a regular basis. We hope that this helps and feel free to get in touch if you have any questions. If you liked this research and want to know more about organic produce in Singapore or are just interested in learning about organic food then we'd like to invite you to read our two part series, "Is organic food in Singapore really worth it?". If you have any kind of metabolic disease, high cholesterol, high blood pressure, diabetes, cancer, heart disease, neurodegenerative problems or any disease that is a result of poor lifestyle choices and habits then you really owe it to yourself to read these articles. As always feel free to contact us should you have any questions. We're here to help and support you. We finally got a reply from Meng Kee Farm regarding their Kee Song chicken and they have reported that their chickens are only fed organic maize, soya bean, pollard, and rice bran. This is good but they go on to say that they are also fed supplements and additives and this has been reported to MyOrganic Malaysia which is a new certificate that has very little information available. It appears that Keesong's certified organic status is currently under review. In addition the chickens are definitely not free range. Based on this new information our conclusion from above still stands and we would advise selecting either the frozen organic chickens or ideally the fresh chickens from Toh Thye San before Keesong's. However Keesong's chickens are a far better alternative to conventional/commercial chickens.